Matt’s Lawncare began in the late 1990’s with a young man named Matt, willing to work to earn money by cutting the lawns in his neighborhood. Through that period he worked for a landscaper, studied his craft, and provided top quality service. His company now maintains the yards and property for over 200 customers. 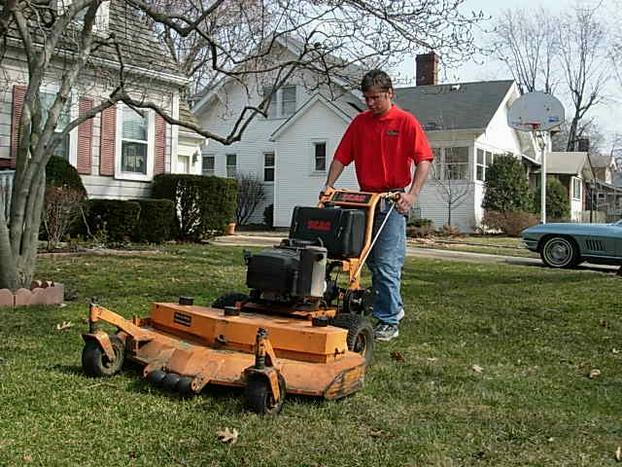 trimmers, edgers, sprayers, tillers, aerators, sod cutters and the variety hand tools required to provide top quality professional service for your yard and lawn. Matt’s is a family organization, a Son and Father team, with Matt’s dad joining him in the company. We are an organization that respects our customers and works to build a long-term relationship. Matt and his Dad believe that the best service companies are founded on experience, education and training. To that end they constantly work to expand their knowledge to better service the needs of their customers, for example…. Along with his full time work commitment to his company Matt recently graduated from Northwestern University in Evanston, Illinois. He completed the requirements for a continuing studies certificate in Residential Landscape Design and Management. This certificate program provides students the opportunity to develop or refine skills in residential design, graphic presentation and practical horticulture science. These are in addition to a variety of classes he has taken at the Chicago Botanic Gardens. Matt’s is a member of the Midwest Regional Turf Foundation of Purdue University (MRTF), Matt & Jim regularly attending Turf Day at the Daniels turf center and a variety of educational programs throughout the year. It is the goal of the MRTF to support turf research and education for the improvement of turf in Indiana and the Midwest. Matt’s Dad Jim, is a certified applicator and leads the company’s turf program. The company is licensed in Indiana by the Office of the Indiana State Chemist and in Illinois by the Department of Agriculture to apply herbicides and pesticides for hire on residential and commercial turf areas and on ornamental plants. In addition Jim has attended a variety of classes which deal with turf management and maintenance, including the four day “Short” course sponsored by the turf schools of Purdue University and the University of Illinois. He also is a trainer and speaker on the topic of turf maintenance; providing seminars at the Lake County Main Library and the branch libraries in Highland, Munster, and Lowell. Staff are regular attendees at the annual Mid-America Horticultural Trade Show in Chicago. Matt’s was one of the first companies to provide seminars regarding the Emerald Ash Borer, the insect destroying millions of trees across the Midwest, and has work with experienced arborists in Michigan to attempt to develop a plan with which to combat these predators in Indiana. This information is just a sample of the efforts that they apply every year in order to remain current with changes in the field and in order to provide the best service for their customers.